Home Warm white or cool white, which LED bulb should you choose? We often get asked which type of LED lighting to choose. Whether it's for LED strips or LED bulbs, we have two types of whites available: warm white, that generates around 3000 Kelvin Degrees (3000K) and cool white that generates about 5000 Kelvin Degrees. 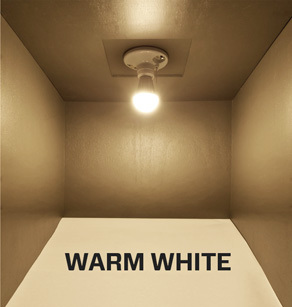 Warm white is a yellowish that resembles a traditional incandescent or halogen light. Cool white on its side, leans towards shades of blue and more like the light you would get from a neon. Although we all perceive light in a different way and personal tastes vary, there are some scenarios where most people agree on the most appropriate lighting type. The living room, dining room, bedroom or any other room where you want soft lighting. Warm white is more relaxing for the eyes and softens the skin tone and reduces imperfections. We all look better in warm white. The kitchen, the garage, the workshop, product displays, hair salons, make-up room, industrial applications or any other application that requires a lighting that will represent the real color of an object. Furthermore, cool white is always more luminous than warm white. For LED strips, the same principles can be applied, with a few small differences. For LED lighting under kitchen cabinets, most people will turn to cool white. However for more rustic or country looking kitchens with wood cabinets and counters, we suggest to go with warm white. Cool white has a more modern look and will best suit laboratory kitchens, granite counters, tiles and similar materials. In a nutshell, we can conclude that cool white LED lighting best suits practical applications while warm white is best for living areas. However, as mentioned earlier, everyone has different tastes. When in doubt, buy a bulb of each kind to see which one you prefer, prior to buying bulbs for the whole house. If you feel like the cool white is too blue for your taste and the warm white too yellow, then take a look at Natural White lighting. Our Natural White 5050 LED Strip kit stands somewhere in the middle, at 4500K, a white light that won't alter your perception of colors. It's a great solution for anyone doing precision work with makeup, hair color, photos, illustrations, paintings or anything requiring an uncompromised look at colors.